This painting was a good lesson learned in so many aspects. The most basic premise to art is making sure your composition works, so if you could have only seen what this painting started out as (bland sky, cliffs winding halfway across the entire scene, etc.). Leaving it alone for several days, but always looking to assess the scene, the painting finally started to talk to me and after two major scene changes I could see where the piece was headed. Timeless, an acrylic painting (8×10) on a gesso-prepared hardboard. Learning how to paint with acrylic paints continue to fascinate me, I enjoy the whole process of learning what brushes to use for what strokes, certain effects and important to the seascapes, getting the shadows of sea-foam on waves. The scene was painted from my imagination, the challenge with checking the composition became a great lesson learned from this piece (a thumbnail sketch would have been the easier route from the start). I’ve read that Phthalo Blue has very strong tinting power – much too, as a little goes a long ways (fine in a limited quantity for warmer and tropical climates) I learned my lesson in the early phases of this painting. When working on seascapes that originate Northern waters or NW waters are colder and deeper blues I’ll probably stay true to Ultramarine, Cobalt, Prussian Blue and Ceruclean when working future seascapes. Trust me, I covered nearly 100% of the Phthalo in this scene. Thank you for stopping by. Click onto the image for a larger view of details. 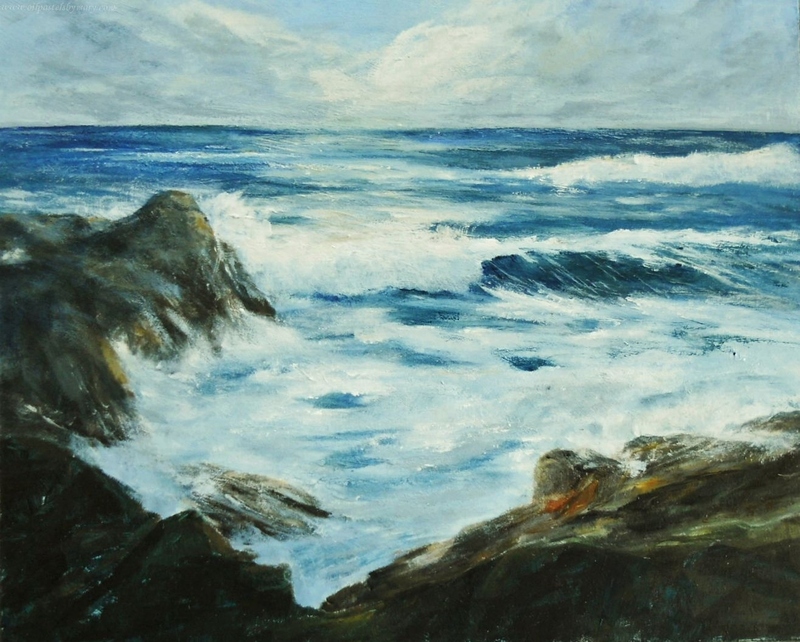 This entry was posted in Acrylic Paintings and tagged acrylic, art, fine art, ocean, painting, rock, Seascape, waves. Bookmark the permalink. I so love this. It reminds of the Maine coast. And I love the deep blue color of the water. Thanks very much Elizabeth. Maine’s coast offers a lot of inspiration and with it creativity, a very special place – just as Cape Cod is for you. Visiting Maine next week – can already taste the clam chowder!! A stunning seascape Mary! All the more so because you created it from your imagination. Thank you Madhu for your generous feedback. It was a bit of a struggle, but eventually the scene began to unfolded and I could feel my way through it. Thank you Heidi – my problem is I’m stubborn and probably don’t know when to give up, lol! Appreciate your kind words on this piece. Getting the right shade is so important. Like finding the right voice in writing. Thank you Brenda – you are so right, there is a link in our trades! Yes, stick with those acrylic paints–they are working for you. So nice Dsaquarelles, thank you very much my friend. Have a wonderful and creative week!! I love learning a new craft or art, it is wonderful to watch others progress along that same rewarding path. Thanks so much Charlie, nice to see you again. It has been a good and rewarding time learning about acrylics. Have a great week ahead. Hi Susan, thanks so much You are so right – couldn’t believe how bright and loud (obnoxious). Yeah I agree about the Northern water tones. It really has been a rewarding experience painting with acrylics – I think I was ready to let go and see what happens. Thanks so much and your acrylic paintings are beautiful! Mary, this is such a feast for the eyes! I picked up the book you mentioned (Amazon had it for not too much) called Painting Better Seascapes in Oil.. have just started the beginning few pages, but what a gem! 🙂 Also, phthalo blue is definitely overpowering! I found that out when trying to paint a space scene for my son’s room.. eek! Thank goodness I used acrylics! Like you, I could cover up all the damage and choose another blue (I went with indanthrone). Your work is amazing and I’m so happy to be able to watch (and learn) from the sidelines! Hugs and happy weekend! Hi Rose, I’m thrilled that you ordered the book (mine is older and smells a bit musty – but contents well worth it). You will find it one of the most comprehensive in studying and then painting the sea – oils, acrylics – doesn’t really matter, the concepts are spot-on. Thank you for your beautiful feedback, always appreciate your enthusiastic response to my work. Mary, my book is just as old and musty smelling.. was a former library book! But I know what you mean, there are lessons in the book that are timeless! God bless you, thank you for the time it takes you to respond to all of us. That personal touch is worth it and makes us feel connected! You’re welcome – I think you’ll enjoy the book. Great thing about the blogging world – the connection to many others. Have a great week. the waves and the foam, fantastic Mary! Thanks very much Debi, always appreciate your encouraging support! Thanks very much Paul – love reading your response to the painting! I grew up near the ocean and your paintings always remind me of the good ol days! Beautifully done! Painted with your own imagination. That is so special, Mary! I always enjoy your beautiful seascape paintings. 🙂 Thank you for sharing. Thanks Amy – I really appreciate your kind words! Hope you have a wonderful week capturing those amazing images through your lens. This is absolutely stunning, Mary! The colors are spot on. Well done, my friend! Well, once again, I seem to be intrigued by a different part of your work than the norm (perhaps because I’m such an unstudied eye?). Anyway, what I’m noticing is how the clouds pull your eyes a certain way (toward the centre) and only after my eye has landed in the centre does it eventually work its way backward following the path of light you so thoughtfully laid out to finally notice the stones. It’s a very interesting piece that way, Mary….I can’t recall another one where I’ve felt you almost directed how I viewed it! ugh. changed my mind 3 times on what to call myself “unstudied” finally winning, but forgot to change my “a” back to an “an”. Please correct for me! And you have nailed it A! Awesome, because the sky is where it all began for me after several large changes to the scene (sky was expanded and 3/4’s of the rock mass wiped out) – once I landed on the “ah” factor the rest of the scene started to fall in place. Always love when you are able to stop by and analyze the art, through your eyes and description I do enjoy. If you notice from the foreground the “S” shape of the water flow that takes you straight back to the sky – the design worked as you noticed. Thanks very much my friend. Mary, you make me feel so “included” in the art world…….thanks! You have a great eye when viewing art. Is there a museum in Erie that you have visited? Bleh! I avoid museums like the plague, Mary. Seems I’m just partial to your art! Perfect Michael – thank you. A great compliment to know one of my pieces brings you to the scene. Thank you my friend – I’m enjoying my time painting with acrylics! Hope you have a creatively great week ahead! So appreciated Alok – thank you for your generous comment. Hope you have a wonderful week ahead. Thanks Rita, never thought this one was going to see the light of day – several major re-works slowly gave the scene some life. It’s so much easier to change areas with acrylics that aren’t working, than with OPs ~ I’ll be gradually working my way back to OPs for some still life’s and such later this year. Have a great week. I love the composition, it is really inviting and amazing done from memory! You did a great job with the blues, I find they are so hard. So far i’ve tried ultramarine and cobalt and I find if you mix them each with cad yellow/yellow ochre and some cad red too you can get some nice soft greys next to the purer blues too. Thanks so much Anna, really appreciate your artistic response to the painting. For me it’s the feel of the water’s pull and seeing what’s there – it has kind of stayed with me. Great observation, you are so right on about mixing those soft grays using compliments, on a couple previous paintings they were used throughout. I lost my footing on this painting though with so many major changes made early on that in the end my sea-foam shadows weren’t quite as dark or gray as I would have liked. My next painting a hefty concentration will be on working those sea-foam shadows Thanks again Anna, really appreciate your thoughts! You did it! Feels like I am standing right on the edge of those rocks with sea swirling all around and the tide pulling me out. Kudos Mary! Cool Dorann! I’m so glad you enjoyed this piece – great reaction to the tidal pull. Thanks so much and have a great weekend! Thank you so much Sylvia – appreciate it! I love the sense of distance in this, Mary. I fell that if I could get past the turbulence in the near, I could eventually walk on water toward the horizon! Very Lovely. As your “word- nut” friend I have to tell you I enjoyed your uncertainties about the blues (paint not sadness). The word “cerulean” comes from the Latin “caeruleus” which means “sky blue” and the word “ultramarinus” is Latin for “beyond the sea.” “Pthalo”, on the other hand is a chemical term and that color is synthetic—probably why it screams a little. Love reading your reaction to this painting Cynthia, thank you!! Many major changes took place here until the scene decided to finally emerged, but I think this is why I really enjoy acrylics (I can changed until my heart is content, unlike with oil pastels). Still learning about color mixing and getting those all important values right on the sea-foam, this important element will be the area most concentrated on in my next painting. Thanks so much for the information on the blues, they fit perfectly with some early descriptions I’ve read about especially with cerulean and ultramarine. Several readings of late warned about the strength of phthalo and to use only a tiny bit, and based on what you wrote I understand why. I used cerulean a lot in my oil pastel seascapes for the sky, but I’m not totally warmed up yet to the cerulean acrylic paint that I have. Thank you so much Resa, hope you are enjoying your Saturday! So beautiful! Your scenes are so captivating. Do you draw on location, work from photographs, or from what visualize? Thank you BB! Having lived by the water for many years, both the West Coast and East Coast I can draw from memory because I have had the benefit of watching the water’s energy, movement and patterns. Today I work from memory and photographs, or sometimes I paint as a study from a masters work so I can get a feel for their development of a scene. If working from a photograph it’s not uncommon for me to change elements, temperature, colors of the scene to make it fit my vision. I don’t understand how it is possible to paint something like this out of only imagination! It’s so …real and fresh and beautiful. i can almost feel the wind and the tiny drops on my arm…You are a very very talented artist! Thanks so much Ann-Christine, if only you could have seen what the painting was before – after completely painting over two large sections of the scene and starting over this is what ended up emerging. Love reading your response to the scene. Thank you for your encouraging compliment – means a lot. Wow. A scene to get lost in, for sure. Lovely work, Mary! So peaceful and mesmerizing. Thanks for sharing it with us! Thanks very much Laura – your reaction was just what I was looking for. Being right at the waters edge in this scene would have had more energy and turbulence, disturbing the quietness of being at higher elevation. I agree with you about the tinting power of phthalo blue, but I find for cerulean that it doesn’t have enough tinting power. It fades into whites and other blues/greens far too easily. It’s a frustrating colour for me. I feel I’m misusing it. I’ll be interested to hear how you find it, going forward. Thanks Pauline. I was horrified on how overpowering the Phthalo was, the more I looked at it the more my instinct screamed paint it out. I do agree about Cerulean, I was surprised at how underwhelming it was and I needed to tint it up with a touch of cad yellow (whereas oil pastel cerulean that I’m used too is more tinted toward green and quite beautiful).